Where is the nearest bin? 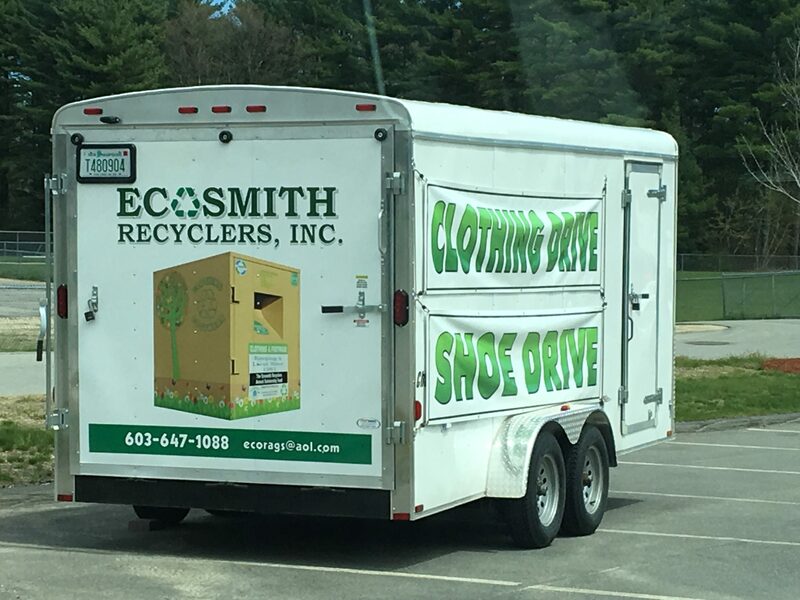 Since 1991, Ecosmith Recyclers has kept over 45 million pounds of shoes, clothing and household textiles out of landfills, and in circulation, while giving back over one million dollars to local non-profit groups. Ecosmith Recyclers Inc is a sustainable, locally owned, for profit family textile recycling business serving New Hampshire, Massachusetts and Maine since 1991. Ecosmith is now offering drop-off service at our warehouse on 11 Byam Rd. in New Boston, NH. Now it's easier than ever to donate! We frequently maintain and service all of our collection locations, bringing all collected materials back to our warehouse for packaging and distribution. We use several different methods for fundraising. Each option is flexible to your organization's needs, establishing a simple and effective environment for raising capital. Have you seen the show Marie Kondo “Tidying Up”? It’s a great resource in helping people purge! Please consider placing your unwanted purged items into an Ecosmith bin. We will make sure it ends up in a place where someone else will appreciate and reuse it. There are so many positive outcomes from this! Not only are you helping your local environment by keeping these items out of the trash and passing them on to others who will use them, you are also helping your local non profits. Ecosmith Recyclers has given back over $1.5 MILLION DOLLARS to local non profits!! Ecosmith Recyclers Inc. shared a post. On Saturday December 22nd, Ecosmith's manager Jon Franklin and employee Justin Miers along with his beautiful wife Christina and their awesome daughter Presley teamed up with Bearded Sinners Beard Club of New Hampshire in picking up tons of turkeys to deliver to New Horizons for New Hampshire/ Families in Transition. It was with pleasure that our manager at Ecosmith Recyclers, Jon Franklin, went out to deliver toys to New Horizons for New Hampshire. These new toys were collected from our bins from our generous donators, Ecosmith personally purchasing and contributing some new toys, Stark Brewing Company's collection box at their facility, and Bearded Sinners Beard Club of New Hampshire help as well. Bearded Sinners Beard Club of New Hampshire were also able to collect several bags of new dog toys that were both donated to pet owners @New Horizons for New Hampshire and Animal Rescue League of NH (Bedford). Once again we could never thank those enough who helped participate in this effort! "No one is useless in this world who lightens the burdens of others." Ecosmith Recyclers has partnered with Bearded Sinners Beard Club of New Hampshire in the collection and distribution of toys for the families of @New Horizons for New Hampshire and Families in Transition. This will be our last week of collecting for this Christmas Season. Please consider dropping an unwrapped toy in an Ecosmith bin and we will make sure to find a local child who appreciates it. Ecosmith Recyclers is teaming up with the Bearded Sinners Beard Club of New Hampshire and Stark Brewing Company in collecting toys for the clients of Families in Transition and New Horizons for New Hampshire. If you are interested in supporting this effort, please drop a new unwrapped toy into one of Ecosmith's bins. Would you like to know where the most convenient bin near you is located? Send us an email ecorags@aol.com with your zip code and we will get that information to you! You can also drop off a new unwrapped toy at the collection box at Stark Brewing Company!They are located at 500 N Commercial St., Manchester, NH for those of you who do not know. Thank you to all of our supporters in helping us give back! We could not do it without you! Being a family owned business our daughter's Molly and Emily stopped by Hannaford's yesterday to grab some bags to "Help Feed Our Neighbors in Need". Ecosmith Recyclers Inc. is with Bearded Sinners Beard Club of New Hampshire and 3 others. “EcoSmith Recyclers has provided a great, easy opportunity for Special Olympics New Hampshire to generate additional revenue to support our programming. “DreamCatchers New Hampshire is pleased to partner with Ecosmith Recyclers Inc.